It’s time for another installment of Gym Bag Makeup! I really enjoy giving little mini reviews on the products I’ve been taking with me to the gym, and I especially love getting to pick out some new products to fill my bag for the following weeks. It’s a great way to keep shopping my stash. On to the pretty things! MAC Sea Me Hear Me from the Alluring Aquatics collection: everyone says this, but MAC might need an intervention on the whole limited addition thing. It’s out of control. This is a pretty natural blush, not too dissimilar from Benefit’s Rockateur. 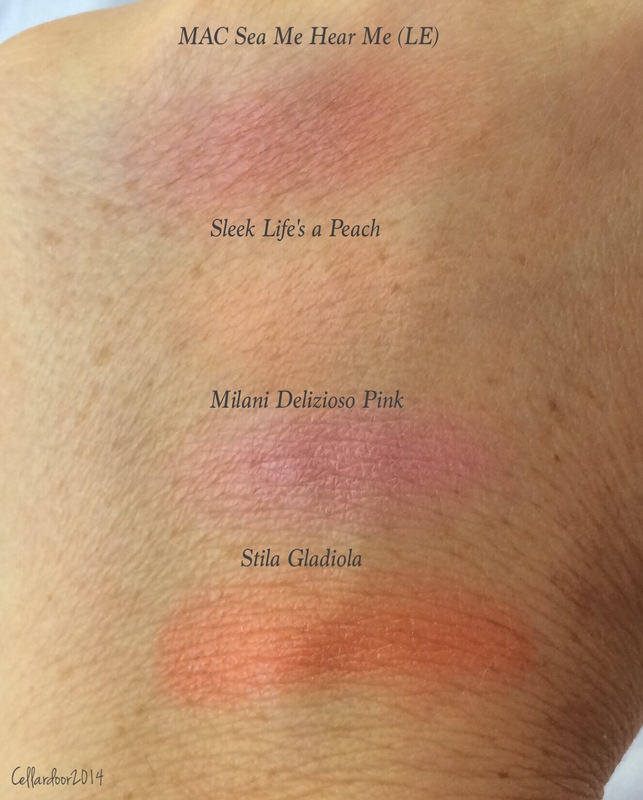 Sleek Life’s a Peach: A very pretty and affordable peach blush. It’s a tad powdery but blends easily. It is on the more orange side of the peach spectrum. Milani Baked Blush in Delizioso Pink: a bright cool pink blush that falls somewhere between matte and satin. Stila Convertible Color in Gladiola: a beautiful light orange cream blush. Urban Decay 24/7 Glide on Eye Pencil in Psychedelic Sister: the 24/7 eye liners are a little hit or miss performance wise. This one is a beautiful true purple with a sheen. It does apply a little patchy and doesn’t wear well on the water line. Milani Gel Powder Eyeshadow in Bella Rouge: I have to be honest, I never actually used this. I snagged three of these when they first came out and was not impressed. I’ll try to actually use it so I can give a more thorough impression. Hard Candy Single and Loving it eyeshadow in oink! : this is a nice highlight shade but I feel very indifferent about it. It’s ok. That’s all I can think of to say really. Now wasn’t that helpful? 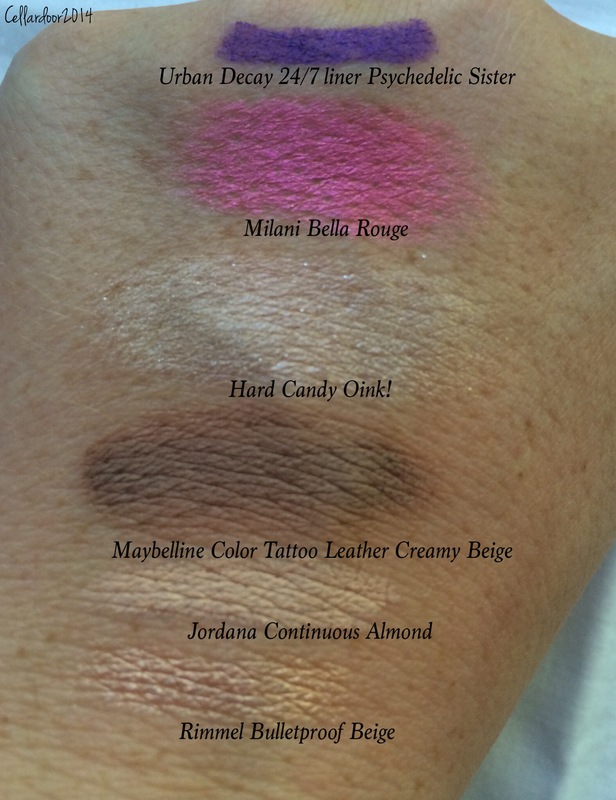 Maybelline Color Tatto Leather in Creamy Beige: I love this. It’s creamy, long wearing and matte. Get you some. Rimmel Scandaleyes Eye Shadow Stick in Bulletproof Beige: this really should be in my “staples” side of the bag as it’s my go to eyeshadow look if I’m in a rush. It’s lovely, blend able, long wearing no creasing goodness. Jordana 12 HR Made To Last Eyeshadow Pencil in Continuous Almond: this should also be in my staples section. I don’t like most eye primers as I find they dry out my eyelids but this, this is amazing. It evens out the color of your eyelid, creates a sucky base, keeps eyeshadows from creasing and doesn’t give your eyeshadow a weird texture. It’s the bomb diggitty.